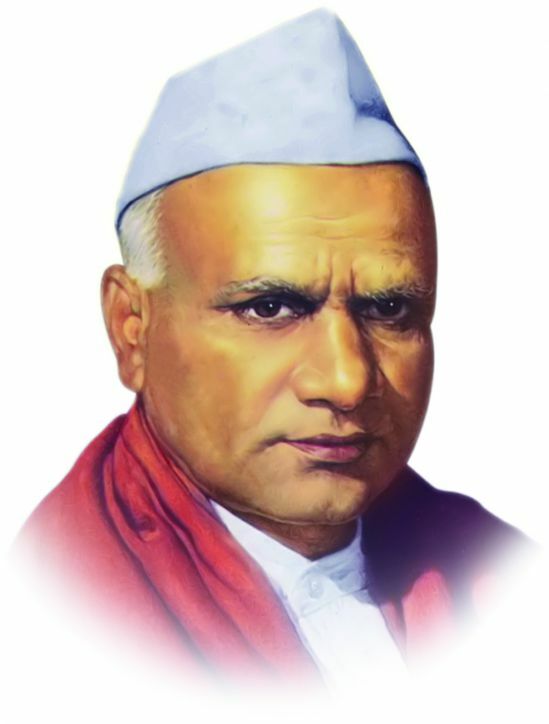 Dr. Bapuji Salunkhe alias Govindrao Dnyanojirao Salunkhe, the great visionary educationlist founded Shri Swami Vivekanand Shikshan Sanstha, Kolhapur in 1954 which is catering to the education needs of students belonging to 11 districts of the State of Maharashtra. Presently, it is functioning through its 330 educational and cultural centers which include 170 high schools, 8 training colleges, 18 arts, commerce and science colleges, 66 junior colleges, 3 B.Ed colleges, one law college, multipurpose high schools, 19 hostels, and one asharamashala (residential school). Most of these education centers are situated in the rural, backward, hilly, drought-hit and remote parts of the state of Maharashtra. Nearly, more than two lakhs of students are receiving their lessons in the Sanstha’s different centres. All these centres of the Sanstha are manned with well-qualified, experienced and dedicated faculty, administrative and menial staff . Dr. Bapuji’s dedicated work, great service to the downtrodden and poor communities of the society is rewarded by the Government of Maharashtra by awarding him with the title “Dalit Mitra”. Shivaji University, Kolhapur conferred on him the degree of D.Litt. The people awarded him with the title “Shikshanmaharshi” for his yeoman’s efforts an pioneering work in the field of education . Swami Vivekananda is a role model of India Culture. He is a representative of truth, character, glory, sacrifice, devotion, generosity, anticipation and hard work . This education trust works respecting the philosophy and teachings of the great Saint Shri Swami Vivekananda. So this institution is named after him. It is Shri Swami Vivekananda Shikshan Sanstha, Kolhapur(Maharashtra), India. Dr.Bapuji, who worked with the missionary zeal, determined the motto of the sanstha. It means “Spread of Education for the Propagation of Knowledge, Achievement and Culture”, It stresses the seeking of knowledge and its proper application so that man can become cultured and morally sound . The prayer of the sanstha states that all great saints of the world are the incarnation of good and god. They have the power of enlightening the mankind. The principles by which the cultured man must live are truth, morality, character, honesty, sacrifice and expulsion of exploitation. The man who practices these principles in his life, he no doubt gets real knowledge and intellectual rapture. This is the firm faith of Dr.Bapuji Salunkhe. The life and mission of Shikshan Maharshi Param Pujya Bapuji Salunkhe will be marked as the golden era in the education history of Maharastra. He is widely known as ‘Bapuji’,but his orginal name is Govindrao Dnyanoji Salunkhe. It was because of the great influence Mahatma Gandhi exerted his life that his kith and kin started calling him ‘Bapuji’, and the same nomenclature caught on in his later life. Bapuji was born at Rampur village situated in Patan Taluka of Satara disrtict. Deprived of both of his parents in his early boyhood. Bapuji had to acquire his education in the face adversity. He took his B.A.Degree in 1945 and passed his B.T.in1949. Endowed with powerful eloquence, Bapuji was interested in Sanskrit and Marathi. Mathematics,too was his favourite subject. The starting point of his education career is in 1940. When he was appointed as ‘Rajguru’ in the priencly state of Sondur.But soon the career came to an end as the electrified patriot plunged himself headlong into the vortex of “Quit India Movement” spearheaded by Mahamta Gandhi. Later during his tenure as the chairman of 'Satara District Student Congress' in 1947, Bapuji proved instrument in collecting funds to the tune of Rs.one lakh in honour of Karmarveer Bhaurrao Patil,the founder of Rayat Shikshan Sanstha. This great mission was recognised by no smaller personality then Mahatma Gandhi, who certified Bapuji to the effect in his own hand-writing, a proud possession still in his preserve. In 1948, Bapuji wrote a short history of freedom fighter in Satara district based on his personal interview with the activists. Bapuji served in Rayat Shikshan Sanstha for a decade-from 1945 to 1955 for the first four years in the capacity of a teacher and then as the headmaster of Mahatma Gandhi Vidyalya,Rukadi which he developed with his missonary zeal and indefatigable work. Bapuji left the Sanstha in 1955, along with a number of his collegues. October 19,1954 saw the beginning of a new phase in Bapuji’s career when he laid the foundation of a new education institute in the presence of his colleagues in Murlidhar temple at Karad. In November,1954, the proposed educational institute was named after Shri Swami Vivekanand at the instance of Swami Ramanand Bharti, the first president of the sanstha. Shri Swami Vivekanand Sanstha was duly registered on 31st of December 1954;and started functioning on the 5th of june 1955. Bapuji and his colleagues set up highschool at Kolhapur,Tasgaon ,Chaphal,Tarale and Undale; a training college for women at Karad,Boys’.Hostels at Kolhapur and Chaphal. This was only the modest beginning of Shri Swami Vivekanand Shikshan Sanstha that was soon to be developed in to 88652 students into the states of Maharastra and Karnataka. The sanstha has the most impressive number of 3160 teaching staff,1221 non-teaching and office staff. The sanstha owns 176 buildings and 70 new buildings are being constructed along with the construction of the new head office. The sanstha has also opened a credit society for its employees. “Dnyan ,Vidnyan ani Susanskar Yasathi Shikshan Praser” (The spread of education is with a view to diffusing knowledge, science and bud breeding) is the motto of the sanstha. Bapuji defines “dnyan as the knowledge of truth, character, integrity,demolition of the exploitative tendencies, service and dedication. “vidyan consists in the applicaton of the aforesaid principles to life which, in turn will lead to good breeding.Bapuji’s conviction is that since ‘Goodness is an attribute of god,formation of good character should receive due emphasis in our educational institutes. Hence sanstha’s official prayer ‘Hare Ram Hare Krishna’, a poem composed by Bapuji himself. Bapuji has dedicated his whole life to the cause of Shri Swami Vivekanand Shikshan Sanstha. He used to receive only the minimal salary of an assistant school teacher right from the inception of the sanstha. In 1962, he bequeathed his inherited property to the sanstha at the inauguration of late Dnyanojirao Salunkhe High-School, named after his father, at Patan. In addition to this , he has donated large amount of money to the sanstha from time to time. He diverted the sum of Rs.1,37,000/- he had receive as gurudakshina in 1973 towards the expenditure of the sanstha. Again ,in 1981 he handed over the amount of Rs.5 lakh, collected by the employees of the sanstha in honour of Bapuji on the occasion of his 60th birthday, with an addition of Rs.101/- of his own, to honorable Vasantdada Patil, the presedint of the sanstha for its due utilization towards the development schemes. Bapuji’s contribution in the national and educational field has been recognised by the Maharastra by bestowing upon him honour of 'Freedom Fighter' and title of ‘Dalit Mitra’. But the true recognition of his services comes from the people who have always held him in high esteem by acclaiming him as ‘Shikshan Maharshi’. The sanstha too has shwon its deep sense of gratitude by naming a recently started college at Karad after this Shikshin Maharshi who has dedicated his entrie life to the casue of education and enlightment amongst the massess. Recently, chancellor of Shivaji University has consented to confer on him an honorary D.Lit.,which comes as the befitting culmination of his career as an educationist. It must indeed, be a unique example of how an humble teacher can build up an edifice of learing with a huge network of educational centres all over the western Maharastra and North Karnataka by dint of his missionary zeal, organisational capacity and indefatigable labour, and ther in indeed lies the crowning glory of his life.